The Japanese are as crazy about ‘western’ sweets as westerners about Japanese food, that is to say cakes, chocolates, parfaits and mousses of all kinds are treats that have a lot of fans in Japan. If you visit any Japanese city, you will most likely find at least a few French bakeries, or patisseries selling all manner of scrumptious cakes and desserts. But European style desserts are not the only kind of delicacy that sweet-toothed travelers can enjoy in Japan. Japanese cuisine has a lot of traditional sweets that are enjoyed by many, especially when accompanied by a nice cup of green tea. 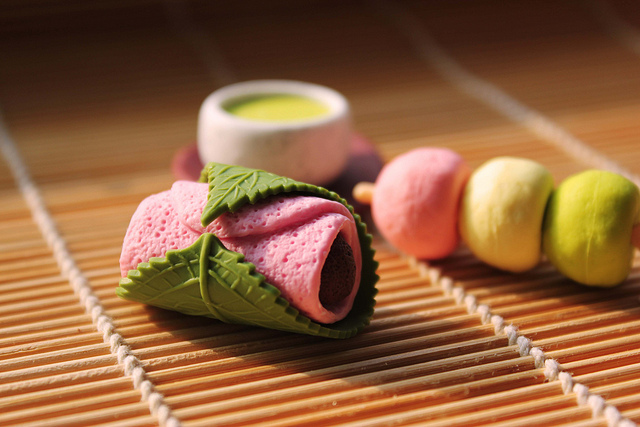 Here are some of Japan’s delicious traditional sweets (called wagashi) that you might want to try during your travels. Anmitsu has been popular for decades, and you wouldn’t believe the ingredients needed to make this white colored gelatinous treat Anmitsu uses cubes of translucent jelly made of seaweed, dissolved in water or fruit juice and served on its own, or accompanied by fruit slices. 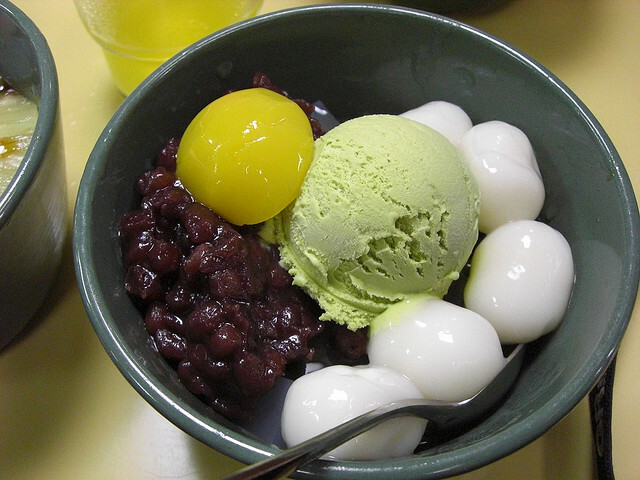 A popular topping for anmitsu is anko, or red bean paste (this is where the an from anmitsu comes from). Daifuku is one of the most famous of Japan’s delicious traditional sweets, and has been a staple in Japanese cuisine for a long, long time. 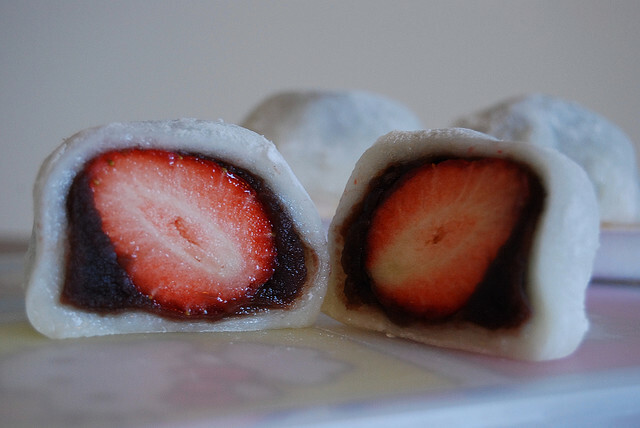 Daifuku is mochi (pounded sticky rice cake) with a filling of sweet azuki bean paste. 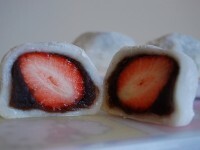 Daifuku can be white, pale green or pink, and come in various sizes. Sweetened chestnuts, strawberries and other types of fruit can also be used as a filling. Monaka is another delicate azuki bean based dessert: two thin and crispy crackers made of mochi are stuck together with azuki bean jam. 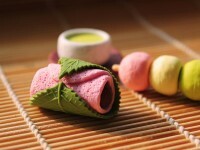 Other versions of monaka are filled with other pastes, like chestnut or sesame seeds, and summer versions can also be filled with ice cream. Monaka are traditionally served with tea, and are so popular that there are specialized monaka stores in Japan. Shiruko is a porridge-like dessert made with azuki beans, which are crushed and boiled and served in a bowl garnished with pieces of mochi, chestnuts, or rice dumplings. In summer, shiruko can be served over shaved ice, but it is a very popular winter dessert, especially when served warm with a topping of condensed milk. Taiyaki is a popular dessert invented in the 1900’s, and possibly the cutest cake you’ll ever see. Taiyaki is a fish shaped dough filled with azuki paste, custard, cheese of chocolate. The dough is a regular waffle batter poured in a special mold, but despite sounding like nothing special, taiyaki are absolutely delicious. Akumaki is a rather strange dessert and an acquired taste, but once you acquire it you will find it absolutely irresistible. Akumaki is made by soaking a bamboo ski in lie and filling it with lye-soaked sticky rice. The resulting rice cake has it rather bitter, but once you drown it in a mixture of toasted soybean flour and sugar, or in honey, akumaki becomes mouth watering. traditional sweets but not traditional for me personally look =) Very cool!